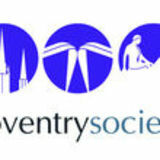 Dear Coventry Society members It is a pleasure to be writing my first Chair person’s report for the Coventry Society’s AGM. This year has been especially pleasurable working with the committee and members of the Society and I look forward to my next and final year in office in 2019/2020. It will be the Societies 50th year in 2020. It all started in 1970 when the Coventry Civic Amenity Society was formed by Ron Morgan to save Kirby House in Little Park Street from demolition. It is ironical that the Council wanted to demolish Kirby House to create a Square of Council Civic buildings and now the Civic Centre that was built instead is being demolished over this Anniversary Year. It is sad to see the loss of the Civic Centre, locally known as the New Council House. Modest but attractive Festival of Britain design buildings are being demolished to make way for a new University HQ . I hope that this year we can celebrate our 50th Birthday and still hold up to the first pledges that were set out in its first Rule Book "The Society is established for the public benefit for the following purposes in the area comprising Coventry and district… A, to stimulate public interest, B, to promote high standards of planning, landscape and architecture. C, to secure the preservation, protection, development and improvement of features of historic or public interest. It goes on to mention research and publication, a coordinating body, to hold meetings, lectures and exhibitions,to educate, to raise funds, to accept gifts of property etc.". For further information on all the articles on the lists below please look at the Coventry Society Website or contact me on paul_maddocks@yahoo.co.uk Planning - We as a Society look at every planning request. In the most cases we do not comment but if we feel it is not up to a high standard or is detrimental to Coventry we put in objections and attend planning meeting to argue our case. This subgroup is led up by Les Fawcett and has the assistance from Jim Passmore and myself but we would like more to get involved. Heritage - Coventry has a very varied history spanning almost a thousand years. The group researches various historic buildings, people and places, to help educate all ages into Coventry's deep and varied history and make contact with other likeminded groups so people can share information and support. This subgroup is lead up by Peter Walters and is able assisted by many members including David Fry, Jayne Long, Brian Stote, Kevin Foxon, and many more. Communication - led by John Payne. You could have the best Society in the world but if people do not know about it its worthless that is why the sub group is so important. With the advance of modern communications over the internet it is both easier and harder to get noticed. This year we stopped publishing our popular printed newsletter after 173 editions. We have replaced it with a Wordpress news website and we have published 60 stories since the site was created in August. Whilst many members will regret the loss of the newsletter, the new approach is more flexible and easier to manage and we can monitor who is reading our news stories. There have certainly been some interesting articles that have got noticed in the city – e.g. stories about Coventry Architects James Murry, Fredrick Gibberd, Harry Quick and John Prevc. This group is helped by many members who contribute articles. 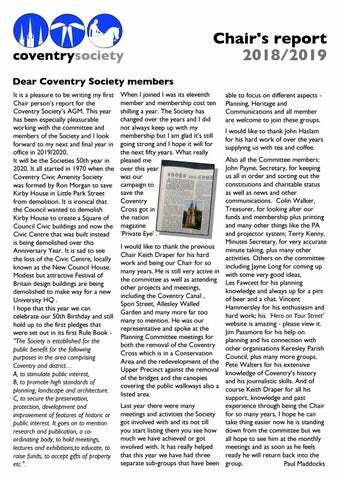 The Coventry Society Chairman's report for the year 2018 - 2019.